If you are not familiar with the concept of cleanvertising, I suggest you have a quick read of this post on Springwise, which is where I first heard of it. Although it looks like someone has spray painted the pavement, it has actually had the graphic cleaned out of the dirt on the floor. So the Bacardi graphic is the clean bit, the contrast is how dirty the floor is. I love this idea because it allows a brand to go geurilla without upsetting anyone or getting fined. It is free media and if the council doesn’t like it, it provides a nice nudge for them to clean the pavement. So how could this be relevant to Sainsbury’s? We are looking for places and ways to remind customers to not forget their reusable bags. Could this be a fun and very PRable of getting the message out there? Opens up a new take on “cleaning up”! This entry was posted on August 19, 2008 at 10:10 pm	and is filed under Other Marketing. 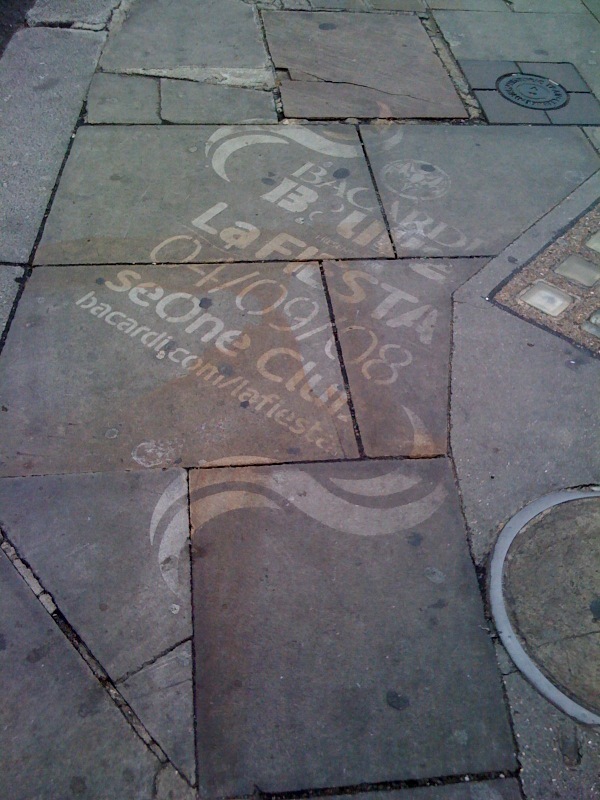 Tagged: advert, Cleanvertising, geurilla marketing, graffiti, ideas, street. You can follow any responses to this entry through the RSS 2.0 feed. You can leave a response, or trackback from your own site.